1 Click on discussion board (note your instructor may have a different name for the same link). 2 Choose the forum you wish to participate in by clicking on its name. 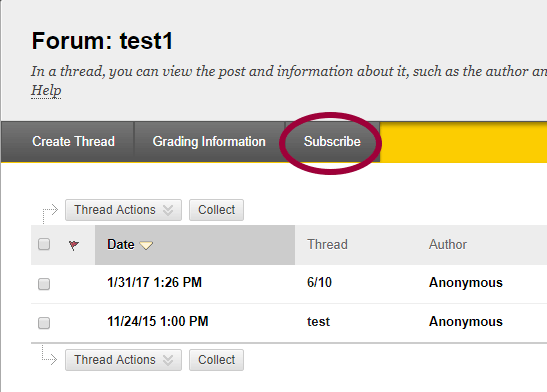 3 To respond to a weekly assignment, or start your own topic, click the Create Thread button. 4 To comment on a post, click Reply under the post. For more information, check out our page on formatting your posts. Instructors may enable the Discussion Board option UAS course sites. You can use the Discussion Board to introduce yourself, to respond to the instructor's questions and reply to other students' posts, or be part of a peer writing and review process. You could also possibly be asked to lead a discussion. One of the great benefits of being part of an online discussion is that you have time to think. In other words, you have time to reflect on what is posted to the Discussion Board, and have much more time to form your own ideas before you have to reply. Not only that you are also able to view past responses, which are not easily accomplished in a classroom setting. You can edit or delete your own posts only if your instructor has made those options available to you. You can't edit or delete others' posts. If you have posted something you'd like removed and the option to delete that post is not available, please contact your instructor. Click the Edit button to modify the message or click Delete and confirm that you want to delete. These Options are located next to the Reply button if your instructor enabled it. If these options are not visible, your instructor has not enabled these settings. Placing the thread in Tree View allows for a more comprehensive view of the entire discussion. This view allows you to see all post titles and replies, but not their contents. Collecting Threads gather posts into a printable, sortable format. Collections are a good way to organize posts for quick reading. Chech the boxes next to the Threads to include in a collection, the click Collect from the Message Actions drop down menu. To select all Threads in a Forum or on the Thread Detail page, click the All link adjacent to the Select: text. Thread Order - Sort in the order the threads were posted to the system. Access the Forum or Thread you’d like to subscribe to from the course Discussion Board. This can either be done through a direct link to a Forum or to the entire Discussion Board. 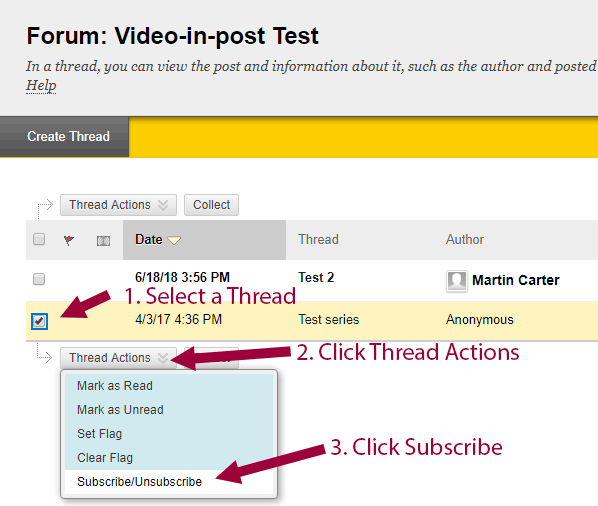 To subscribe to a Forum: click on the Subscribe button above the listed Threads. To subscribe to a Thread: click the checkbox(es) for the Thread(s) you’d like to subscribe to. Click Thread Actions either above or below the listed threads. Click Subscribe/Unsubscribe. You’ll see the Subscribe icon ( ) next to the Threads you’re subscribed to.